Somatostatin from islet delta cells inhibits insulin and glucagon secretion, but knowledge of the regulation of pancreatic somatostatin release is limited. Some insulin secretagogues stimulate somatostatin secretion, and here we investigated whether delta cell secretory responses are indirectly regulated in a paracrine manner by insulin released from beta cells. Hormone release from static incubations of primary mouse islets or somatostatin-secreting TGP52 cells was measured by RIA. mRNA expression was assessed by RT-PCR. Glucose and a range of other physiological and pharmacological agents stimulated insulin and somatostatin release, and insulin receptor mRNA was expressed in islets, MIN6 beta cells and TGP52 cells. However, exogenous insulin did not modulate basal or glucose-induced somatostatin secretion from islets, nor did pre-incubation with an antibody against the insulin receptor or with the insulin receptor tyrosine kinase inhibitor, HNMPA(AM)3. Glucose and tolbutamide stimulated somatostatin release from TGP52 cells, whereas a range of receptor-operating agents had no effect, the latter being consistent with a lack of corresponding receptor mRNA expression in these cells. Parasympathetic activation stimulated insulin, but inhibited somatostatin release from mouse islets in accordance with differences in muscarinic receptor mRNA expression in islets, MIN6 and TGP52 cells. The inhibitory effect on somatostatin secretion was reversed by pertussis toxin or the muscarinic receptor 2 antagonist, methoctramine. A number of insulin secretagogues have analogous effects on insulin and somatostatin release, but this similarity of response is not mediated by an indirect, paracrine action of insulin on delta cells. The online version of this article (doi: 10.1007/s00125-012-2546-9) contains peer-reviewed but unedited supplementary material, which is available to authorised users. Insulin-secreting beta cells are located in the islets of Langerhans, which have a complex three-dimensional structure that also contains other cell types, the most numerous of which are glucagon-secreting alpha cells and somatostatin-secreting delta cells. Previous work has demonstrated that interactions between cells within the islet are essential for ensuring the appropriate pattern of insulin secretion [1, 2, 3, 4, 5]; and possible interactions between alpha and beta cells within islets have been well studied [1, 6, 7, 8, 9]. For example, alpha cells express the insulin receptor  and a number of studies suggest that beta cells negatively regulate glucagon secretion, although it is uncertain whether the paracrine agent is insulin, zinc co-released with insulin or some other beta cell secretory product [7, 8, 9, 10]. Less attention has been paid to the potential intra-islet roles of delta cell-derived somatostatin, but from studies of somatostatin-deficient mice, we recently identified an important paracrine role in the regulation of islet hormone secretion, where locally released delta cell somatostatin inhibited insulin and glucagon secretion . To understand the roles of delta cell somatostatin in the regulation of islet function, it is essential to know how physiologically relevant stimuli affect somatostatin release from islet delta cells. Current knowledge of the regulation of somatostatin secretion is limited, but the available evidence suggests that delta cells respond similarly to beta cells. Accordingly, some studies have demonstrated that glucose stimulates both insulin and somatostatin release [11, 12], as do membrane-depolarising agents such as arginine and sulfonylureas [11, 13, 14, 15, 16], as well as the incretin, glucagon-like peptide 1 (GLP-1) [15, 16, 17, 18, 19, 20]. These observations may reflect similar stimulus–response coupling mechanisms in beta and delta cells, but they could also suggest that delta cell secretory responses are indirectly regulated in a paracrine manner by insulin released from beta cells. Single-cell PCR measurements have shown that some islet delta cells express INSR mRNA , but the role of insulin in the regulation of somatostatin release is unclear. No or little effect of insulin has been reported on somatostatin secretion from isolated rat islets  or perfused canine pancreas [23, 24], although stimulatory effects were seen in perfused human pancreas . 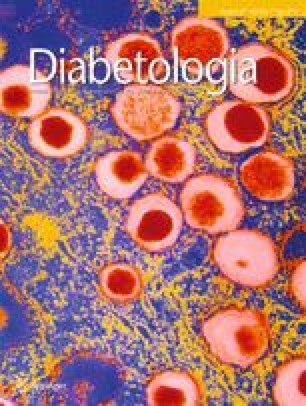 Interestingly, Trimble et al  found that rat islets from a streptozotocin-induced model of diabetes were glucose-insensitive with regard to somatostatin release, but that responsiveness was restored upon in vivo treatment with insulin, consistent with glucose-induced somatostatin release being secondary to insulin release. In the present study, we used exogenous insulin and insulin receptor antagonists to investigate a potential paracrine role of endogenous insulin in the regulation of somatostatin secretion. We also assessed the secretory capacity of a somatostatin-secreting cell line, TGP52, to investigate whether the secretory characteristics of somatostatin are maintained in the absence of any beta cell input. Experiments involving animals were approved by the local ethics committee. Islets from male ICR mice (30 g; Charles River, Margate, UK) were isolated by collagenase digestion (1 mg/ml, type XI; Sigma, Poole, UK) and separated from exocrine pancreatic tissue on a histopaque gradient (Sigma), as described previously . Islets were incubated overnight at 37°C (5% CO2) in RPMI 1640 medium (10% [vol./vol.] FBS, 2% [vol./vol.] glutamine, 100 U/ml penicillin with 0.1 mg/ml streptomycin, 11 mmol/l glucose) prior to experiments. Somatostatin-secreting TGP52 cells (passages 21–28; ATCC, Manassas, VA, USA) and MIN6 cells (passage 32) were maintained at 37°C and 5% CO2 in 1:1 DMEM Ham's F12 (10% [vol./vol.] FBS, 0.5 mmol/l sodium pyruvate, 100 U/ml penicillin with 0.1 mg/ml streptomycin, 17.5 mmol/l glucose) and DMEM (10% [vol./vol.] FBS, 2 mmol/l glutamine, 100 U/ml penicillin with 0.1 mg/ml streptomycin, 25 mmol/l glucose), respectively. The medium was changed every 3 days, and the cells were passaged and used for experiments when 70% to 80% confluent. Hormone release was assessed in static incubation experiments. Islets were pre-incubated for 60 min at 37°C in a bicarbonate-buffered physiological salt solution  containing 1 mmol/l glucose, after which batches of 12 islets were incubated for 60 min in 0.4 ml salt solution with the agents of interest. TGP52 cells were seeded at a density of 200,000 cells/well in 12-well plates and cultured for 24 h to allow for cell attachment. The cells were then pre-incubated and incubated as above in 0.5 ml salt solution. The pharmacological agents, phorbol myristate acetate (PMA) and forskolin, were routinely included with other secretagogues as internal controls for secretory responsiveness. For assessment of hormone content, islets or trypsinised cells were washed twice with PBS, pelleted by centrifugation (200×g), lysed in acidified ethanol and sonicated. Exogenous insulin from bovine pancreas (containing approximately 0.5% zinc) was obtained from Sigma UK. A rabbit antibody specific to the insulin-binding region (aa702-719) of the alpha subunit of the insulin receptor (type A and B) was from Biogenesis (Poole, UK) and the insulin receptor tyrosine kinase inhibitor, HNMPA(AM)3, was from Calbiochem (La Jolla, CA, USA). The phosphoinositide 3-kinase (PI3-K) inhibitor, LY294002, and methoctramine tetrahydrochloride (MTT) were obtained from Cambridge Bioscience (Cambridge, UK) and MP Biomedicals (Cambridge, UK), respectively. The hormone content of cell lysates and incubation media was assessed by RIA, using an in-house insulin or glucagon assay as described previously  and a commercially available somatostatin RIA kit (Euro-Diagnostica, Malmö, Sweden). For the assessment of protein content, islets or trypsinised cells were washed twice with PBS, pelleted by centrifugation (200×g), lysed in 0.5 mol/l NaOH and sonicated. Protein content was measured using Bradford's protein assay . RNA was extracted from islets and cells using a kit (RNAeasy; Qiagen, Crawley, UK). Reverse transcription to cDNA and PCR amplification were performed as described previously  using the cycle variables and primer sequences listed in electronic supplementary material Table 1. The primer sets for the insulin receptor were designed to detect mRNA of isoforms A and B. Products were separated on agarose gels and visualised by staining with ethidium bromide (0.1 μg/ml). Data are expressed as means ± SEM, and analysed using one-way ANOVA and Bonferroni's multiple comparisons test. Differences between treatments were considered significant at p < 0.05. Glucose and two other initiators of insulin secretion, tolbutamide and arginine, stimulated the release of insulin and somatostatin from primary mouse islets (Fig. 1a–c). The effect of glucose was concentration-dependent, resulting in a significant release of both hormones at 20 mmol/l, with no significant changes observed at 5 mmol/l glucose. The mean results from six separate experiments (Fig. 1a, b) demonstrate that insulin and somatostatin release was enhanced at 7 and 10 mmol/l glucose. However, analysis of individual experiments showed that statistically significant effects on somatostatin and insulin secretion were only obtained in three of six individual experiments at 10 mmol/l glucose, reflecting the variability of responses between different islet preparations at these intermediate glucose concentrations. Glucagon (Fig. 1d) and the GLP-1 analogue, exendin-4 (Fig. 1e), also potentiated glucose-induced insulin and somatostatin secretion from mouse islets. In contrast, exendin-4 had no effect on basal (1 mmol/l glucose 1.74 ± 0.25 fmol islet−1 h−1 [means ± SEM]; 1 mmol/l glucose + 10 nmol/l exendin-4 2.09 ± 0.14; p > 0.2) or arginine-induced (20 mmol/l arginine 3.23 ± 0.39 fmol islet−1 h−1; 20 mmol/l arginine + 10 nmol/l exendin-4 3.16 ± 0.51; p > 0.2) somatostatin release, as previously reported for insulin . The sympathetic neurotransmitter, noradrenaline (norepinephrine), reduced glucose-induced hormone secretion to basal levels or below (Fig. 1f), whereas pharmacological activation of adenylyl cyclase by forskolin or protein kinase C by PMA strongly potentiated glucose-induced insulin and somatostatin release, although effects on the latter were less pronounced (Fig. 1g, h). Insulin receptor mRNA was expressed in the somatostatin-secreting TGP52 cell line, the MIN6 beta cell line and in mouse islets (Fig. 2a), supporting a previous report by our team on insulin receptor expression in single islet beta and delta cells . To assess whether the observed similarity in secretory responses of delta and beta cells was due to an indirect effect of insulin action on delta cell insulin receptors, somatostatin release from mouse islets was measured in the presence of exogenous insulin (100 nmol/l). No insulin-induced changes in somatostatin secretion were observed at low, intermediate or high glucose concentrations (Fig. 2b), although insulin did inhibit noradrenaline-induced glucagon secretion (10 μmol/l noradrenaline + 100 μmol/l ascorbic acid 46.6 ± 10.6 ng glucagon islet−1 h−1 [means ± SEM]; 10 μmol/l noradrenaline + 100 μmol/l ascorbic acid + 100 nmol/l insulin 22.0 ± 4.0; n = 7, p < 0.05). Similarly, pharmacological blockade of insulin receptor signalling using an insulin receptor antibody (IR-AB) (1 μg/ml, 48 h) or the insulin receptor tyrosine kinase inhibitor, HNMPA(AM)3 (10 μmol/l, 1 h), did not reduce the secretory response of islet delta cells to increasing glucose concentrations (Fig. 2c, d). Activation of the insulin receptor is known to trigger PI3-K-mediated signalling pathways, but the PI3-K inhibitor, LY294002, did not reduce glucose-induced somatostatin release. In contrast, the compound did stimulate glucose-induced somatostatin release (20 mmol/l glucose 1.85 ± 0.19 fmol islet−1 h−1; 20 mmol/l glucose + 10 μmol/l LY294002 3.21 ± 0.3; p < 0.001) and insulin secretion (20 mmol/l glucose 1.63 ± 0.11 ng islet−1 h−1; 20 mmol/l glucose + 10 μmol/l LY294002 5.22 ± 0.58; p < 0.001). The IR-AB was used under conditions that have previously been shown to inhibit insulin action [31, 32]; similarly, 10 μmol/l HNMPA(AM)3 and 10 μmol/l LY 294002 were found to reverse the effect of insulin on noradrenaline-induced glucagon release in parallel secretion experiments. To investigate whether delta cell somatostatin secretory responses were maintained in the absence of any influence from beta cells, the secretory characteristics of TGP52 cells were determined. The cells produced somatostatin, but at very low levels compared with those of primary islets (TGP52 0.42 ± 0.14 fmol/μg protein [means ± SEM]; mouse islets 112.2 ± 25; p < 0.01). Their secretory responsiveness was variable, with glucose-induced somatostatin release only observed in four of six experiments (p > 0.2) (Fig. 3a). Tolbutamide exerted a small stimulatory effect on somatostatin secretion (p = 0.06), and somatostatin release was increased in response to forskolin or PMA (Fig. 3a). There was no concomitant detection of insulin (p > 0.2 vs 0 ng insulin/ml standard in RIA), demonstrating that TGP52 cells did not secrete measurable amounts of insulin, nor was glucagon detected in cell lysates (p > 0.2 vs 0 ng glucagon/ml standard in RIA). In contrast to primary islets (Fig. 1), glucose-induced somatostatin secretion from TGP52 cells was not modified by the presence of exendin-4, glucagon or noradrenaline (101 ± 15%, 111 ± 10%, 114 ± 8% vs secretion at 20 mmol/l glucose, respectively; all p > 0.2), consistent with the detection of Glp1r, Gcgr and α2aar (also known as Adra2a) mRNA in mouse islets, but not in TGP52 cells (Fig. 3b). In contrast, the PI3-K inhibitor, LY294002, enhanced somatostatin release by 67 ± 22% compared with secretion at 20 mmol/l glucose (p = 0.07). While a range of common insulin secretagogues also stimulated somatostatin release from islets (Fig. 1), the acetylcholine analogue, carbachol, had opposite effects on islet beta and delta cells, enhancing glucose-induced insulin release, but inhibiting glucose-induced somatostatin secretion (Fig. 4a, b). The analogue also reduced glucose-induced somatostatin release from TGP52 cells, with 12% and 33% reductions, respectively, in two separate experiments. This differential effect on insulin and somatostatin secretion may be related to differences in receptor expression between the two pancreatic cell types. Thus, muscarinic receptor 3 (M3) has been linked to the stimulatory effect of parasympathetic activation on insulin secretion , and here RT-PCR analysis confirmed that M3 (also known as Chrm3) mRNA was expressed by mouse islets and MIN6 beta cells, but not by TGP52 cells (Fig. 4c). In contrast, muscarinic receptor 2 (M2) mRNA was highly expressed in TGP52 cells, present at low levels in primary islets and non-detectable in MIN6 cells (Fig. 4c), while muscarinic receptor 4 (M4) mRNA was expressed in all three cell types (Fig. 4c). M2 and M4 couple via pertussis toxin (PTX)-sensitive Gi/o-proteins to inhibit adenylyl cyclase; here, 20 h pre-treatment with 100 ng/ml PTX abolished the inhibitory effect of carbachol on somatostatin release (Fig. 4d). PTX pre-treatment also reversed noradrenaline-induced inhibition of somatostatin and insulin secretion, confirming the effective blockage of Gi/o-coupled signalling by PTX (somatostatin: control 54 ± 2% [means ± SEM] of 20 mmol/l glucose, p < 0.001 vs 20 mmol/l glucose only; PTX-treated 109 ± 2% 20 mmol/l glucose, p > 0.2; insulin: control 8.5 ± 1% of 20 mmol/l glucose, p < 0.001 vs 20 mmol/l glucose only; PTX-treated 62 ± 6% 20 mmol/l glucose, p < 0.05). Basal (p < 0.01) and glucose-induced somatostatin secretion (p < 0.001) was significantly enhanced following PTX-treatment in accordance with previous reports on insulin secretion . Consistent with an involvement of Gi/o-coupled receptors, the M2 antagonist, MTT, specifically reversed the inhibitory effect of carbachol on glucose-induced somatostatin release, without affecting carbachol-induced insulin secretion (Fig. 4e, f). Paracrine interactions between islet cells are important for normal hormone secretory responses [6, 7, 8, 9, 11, 22, 23, 25, 35, 36] and are likely to be involved in maintaining the tightly synchronised patterns of pulsatile insulin, somatostatin and glucagon release . There is no doubt that delta cell somatostatin exerts paracrine regulatory effects on islet beta cells [11, 25, 35], while circumstantial evidence exists that beta cells may exert a reciprocal regulation of delta cell function. Thus our previous report of INSR expression in single primary delta cells  was confirmed by our current studies using the TGP52 cell line; moreover, the similar insulin and somatostatin secretory responses to a range of physiological and pharmacological stimuli are consistent with the notion that insulin acts in a paracrine way to regulate somatostatin secretion from delta cells. Glucose is the most important physiological regulator of islet hormone secretion and our data suggest a similar concentration-dependence of beta and delta cells in response to this stimulus. Under these conditions, it is possible that insulin plays a role as paracrine regulator of somatostatin release, since, at least in our hands, the two hormones were released at similar glucose concentrations. This is consistent with a previous study using human islets , but contrasts with other reports of enhanced delta cell sensitivity to glucose compared with beta cells, where glucose concentrations as low as 2 to 3 mmol/l initiated significant increases in somatostatin secretion from mouse islets [12, 38, 39]. Because of these reports, we routinely used a very low concentration of glucose (1 mmol/l) to assess basal, unstimulated levels of somatostatin secretion, but were consistently unable to detect any significant increases in somatostatin secretion from mouse islets at 5 mmol/l glucose, whereas we did observe (non-significant) increases in insulin and somatostatin release at 7 and 10 mmol/l glucose. This suggests that, in our studies, mouse beta and delta cells had similar thresholds for activation by glucose. Despite comparable secretory responses of beta and delta cells to glucose and some other stimuli, our experiments manipulating insulin receptor activation suggest that somatostatin release is not modulated by insulin and that the regulatory effect of insulin secretagogues on the delta cell is therefore unlikely to be secondary to insulin release from beta cells. Thus, exogenous insulin had no effect on somatostatin release from mouse islets at concentrations of glucose that are either sub-stimulatory or stimulatory for the release of endogenous insulin. These observations are consistent with previous studies, in which exogenous insulin or immunoneutralisation had no marked effects on somatostatin release from isolated rat islets  or the perfused canine pancreas [23, 24], although insulin immunoneutralisation has been reported to inhibit somatostatin release from perfused human pancreas . These differences may reflect species-dependent differences in islet architecture  or the different experimental models employed. A lack of detectable responses to exogenous insulin could also be caused by endogenous insulin occupying the insulin receptor. Thus, even under non-stimulatory conditions for mouse beta cells, the basal rates of insulin release measured in our experiments produced extracellular concentrations of 1 to 2 nmol/l in the incubation medium, more than sufficient to ensure occupation of the insulin receptor, whose IC50 is about 20 to 30 pmol/l . However, the lack of effect of endogenous insulin on somatostatin secretion was consistent with the lack of effect on glucose-induced somatostatin release of two pharmacological strategies to block intra-islet insulin signalling. Thus, basal and glucose-induced somatostatin release remained unaltered by pre-incubation with a blocking antibody against the insulin-binding region of the receptor or by the presence of the insulin receptor tyrosine-kinase inhibitor, HNMPA(AM)3, suggesting that a paracrine effect of insulin on delta cells is not required for glucose-induced somatostatin secretion. Activation of the insulin receptor leads to downstream activation of PI3-K-mediated signalling pathways, but the PI3-K inhibitor, LY294002, did not reduce glucose-induced somatostatin release, again suggesting that somatostatin secretion is not dependent on insulin receptor activation. The observed stimulatory effect of LY294002 on insulin and somatostatin secretion is in accordance with our previous report of enhancing, and possibly non-specific effects of the agent on insulin secretion , and corresponds to the similar stimulatory effect on somatostatin release from TGP52 cells that was observed in the present study. Our experiments using mouse islets cannot rule out the possibility that beta cell secretory products other than insulin might influence somatostatin secretion from delta cells. To eliminate interactions from non-delta cells, we therefore assessed the secretory characteristics of the somatostatin-secreting TGP52 cell line. As with other islet hormone-secreting cell lines , the TGP52 cells contained very low levels of somatostatin compared with primary islets and exhibited variable secretory responsiveness, consistent with their transformed nature. Consequently, information on the regulation of somatostatin secretion obtained using TGP52 cells should be viewed as supplementary to that obtained from primary islet tissue, rather than definitive. The TGP52 cells did, however, show qualitatively similar secretory responses to glucose and the sulfonylurea, tolbutamide, suggesting that responsiveness to these initiators of secretion is intrinsic to delta cells, rather than being mediated indirectly. Glucose is accordingly reported to induce metabolic changes and electrical activity in beta and delta cells [44, 45], and both cell types have sulfonylurea-sensitive KATP-channels and depend on Ca2+ for exocytotic release of stored hormones [44, 45, 46, 47, 48]. The relative importance of KATP channel closure for glucose-induced membrane depolarisation and concomitant somatostatin secretion from the delta cell was re-examined recently by Zhang et al , whose results suggest that somatostatin release is dependent on KATP-dependent and -independent processes, with the latter, at least in mouse islets, relying on Ca2+-induced Ca2+ release. Arginine also depolarises the plasma membrane, so the similarity in arginine-induced secretion from beta and delta cells in primary islets may indicate a general importance of membrane depolarisation in the stimulus–response pathway. Similarly, the stimulation of both insulin and somatostatin release from mouse islets by PMA and forskolin suggests an important role for protein kinase C and cAMP signalling in regulating hormone release, an interpretation supported by our finding that those pharmacological agents also stimulated somatostatin release from TGP52 cells. Finally, the similarity of response to the PI3-K inhibitor, LY294002, may indicate the involvement of similar, PI3-K-mediated signalling pathways in secretion from the two islet cell types. The responses of beta and delta cells to receptor-mediated agonists will depend on receptor expression by the two cell types. However, despite initial reports that GLP-1 receptor (GLP-1R) was produced in the majority of beta, alpha and delta cells [20, 50], the same group was later unable to detect the receptor in alpha or delta cells using a range of different, highly sensitive immunohistochemical techniques , observations that supported earlier negative studies . The absence of GLP-1R production by delta cells is at odds with the numerous reports that exendin-4 or GLP-1 exerted stimulatory effects on somatostatin release [15, 16, 17, 18, 19, 20] and may suggest that GLP-1 modifies somatostatin secretion via an indirect mechanism . In the present study, we were unable to detect GLP-1R in TGP52 cells. Moreover, in contrast to primary islets, TGP52 cells did not respond to the GLP-1 analogue, exendin-4, by exhibiting enhanced somatostatin release. These data suggest that GLP-1-induced somatostatin secretion could be dependent on factor(s) other than insulin from non-delta cells, although the lack of GLP-1R in TGP52 might also reflect the limitations of the cell line in representing primary tissue. Glucagon stimulates somatostatin secretion in a number of experimental models, including isolated rodent islets , perfused canine  or human pancreas , and in rats in vivo . The glucagon receptor has been detected in a subpopulation of primary delta cells by immunohistochemical analysis (∼11% vs 97% in beta cells ), although it is unclear whether this relatively low abundance is sufficient to account for the enhancing effect of glucagon on somatostatin secretion. In the present study, we were unable to detect the glucagon receptor in TGP52 cells and did not observe a glucagon-induced secretory response from these cells. Adrenaline (epinephrine) has been shown to inhibit glucose-induced changes in [Ca2+]i from primary delta cells  and pharmacological studies suggest that the observed inhibition of islet somatostatin release by noradrenaline is mediated via α-adrenergic receptors [54, 55]. This is supported by our findings that PTX treatment reversed noradrenaline-induced inhibition of somatostatin secretion. To our knowledge, however, there are no specific reports on α-adrenergic receptor content in primary delta cells; we, moreover, were unable to detect α2a adrenergic receptors on TGP52 cells. Our data suggest that the lack of receptor expression and lack of effect of noradrenaline on somatostatin release from TGP52 cells could reflect a role for non-delta cells in mediating the sympathetic inhibition of somatostatin release. Alternatively, the unresponsiveness of TGP52 cells may be a direct consequence of the specific absence of α-adrenergic receptors in this cell line. The divergent secretory responses to parasympathetic activation observed in this study support the notion that insulin released in response to carbachol does not modulate somatostatin secretion by a paracrine action. The corresponding differences in muscarinic receptor mRNA expression in islets, and in TGP52 and MIN6 cells also suggest that parasympathetic modulation of secretion is dependent on the presence of specific receptors in the different cell types. The importance of M3 for insulin secretion is well-established and has been reviewed ; our results confirmed its presence in islets and MIN6 cells, but not in TGP52 cells. In contrast, M2 (also known as Chrm2) mRNA was highly expressed in TGP52 cells, and to a lesser extent in islets, perhaps reflecting expression of M2 mRNA in the islet delta cell population only. M2 and M4 are mainly linked to PTX-sensitive Gi or Go proteins, which mediate inhibition of processes such as cAMP production and activation of voltage-dependent Ca2+ channels . These receptors have not been ascribed a physiological role in insulin secretion because of the limited effects of acetylcholine on cAMP production in islets , and also because the signalling pathways activated by acetylcholine in beta cells are insensitive to PTX . However, our data suggest that M2 (and possibly also M4) plays an important role in mediating the effect of parasympathetic activation in the delta cell, since inactivation of Gi/o-coupled receptors by PTX and specific antagonism of M2 by methoctramine reversed the carbachol-induced inhibition of somatostatin secretion. In summary, we have shown that although a range of islet hormone secretagogues have similar effects on the release of insulin and somatostatin, this is not caused by an indirect, paracrine action of insulin on the delta cells. Instead, the parallel responses are likely to be caused by similarities in the stimulus–response pathways in beta and delta cells, and by similarities in the presence and abundance of specific receptors. Accordingly, our data demonstrate that the observed difference in response to parasympathetic activation is a direct consequence of variation in muscarinic receptor levels. Since the insulin receptor is produced in delta cells, we suggest that insulin may have other, non-secretory roles in delta cell function, as previously reported in the beta cell, where insulin is involved in regulation of apoptosis . A. Hauge-Evans is a RD Lawrence Fellow (Diabetes UK, BDA: 10/0003980). The authors are grateful for an equipment grant from Diabetes UK (BDA: RD07/0003510) for a gamma counter. In accordance with ICMJE requirements, all authors were involved in study conception and design, or analysis and interpretation of data, as well as in the drafting or revision of the manuscript. All authors approved the final version.